“Behind Her Special Agent Badge” now for sale on Audible! Lee Ann is happy to announce that her second collaboration with authors Floy Turner and Sherrie Clark has just been released. 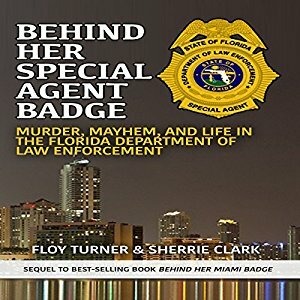 Behind Her Special Agent Badge: Murder, Mayhem, and Life in the Florida Department of Law Enforcement follows Special Agent Floy Turner during her years with the Florida Department of Law Enforcement (FDLE). This biography/memoir contains a number of Floy’s stories. Among her high-profile crime cases are the murder of fashion designer Gianni Versace, the crash of ValuJet Flight 592 into the Everglades, and various other murders, kidnappings, and drug busts. Despite the serious subject matter, Floy still manages to maintain and interject that special ‘Floy’ humor into her stories. Posted by lahowlett on May 3, 2017 in Uncategorized and tagged Audible, audiobook, Behind Her Special Agent Badge, biography, Floy Turner, Gianni Versace, memoir, Sherrie Clark, true crime.